The play centers on a labor dispute at a factory in a small Ohio town where the owner naively fails to anticipate the disastrous impact that hiring strikebreakers will have on his community and his own life. 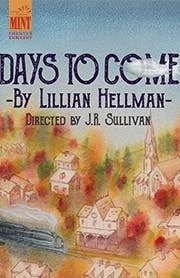 Hellman describes the theme of Days to Come as “evil in the hands of people who don’t understand it.” Audiences barely had a chance to appreciate Days to Come, which closed after just six performances on Broadway. There has only been one production of New York after 1936, 40 years ago. More than a neglected curiosity by one of America’s greatest playwrights, Days to Come is a vital, complex play “about something real, something that matters,” as Harold Clurman described it, writing about the 1978 production for the Nation.